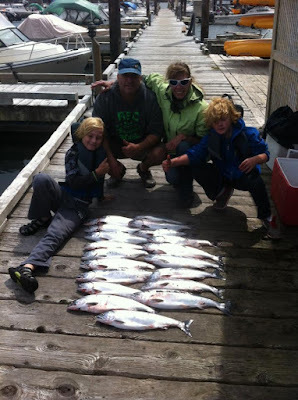 The big chinook salmon continue to come into the docks with regular catches in the 20 to 40 lb range. The pinks are around in abundance now and while some may not like having to sift through pinks to find the big chinooks, this is a great time for new anglers to learn to catch some scrappy salmon. Fresh pinks on the BBQ or smoked is excellent. While the pinks seem to be taking every lure right now, white/glow hootchies are a popular choice. For the big chinooks bait is still preferred with the right roll being the key to catching the big ones (and a closely guarded secret by the guides). 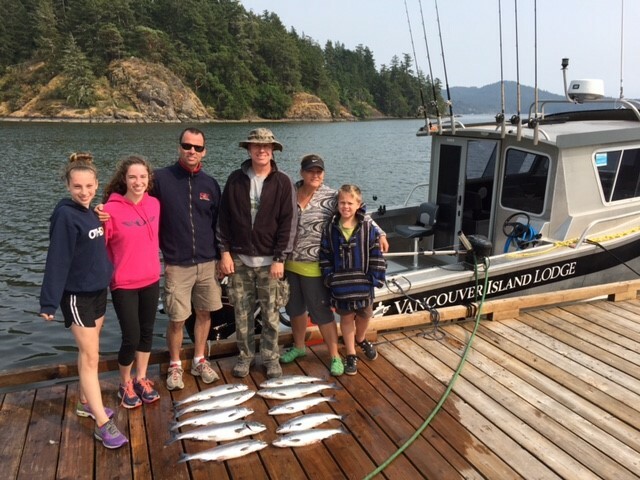 Here's a photo sent to us by Warren Olsen, after a fun day on the water with Vancouver Island Lodge. A great introduction to salmon fishing here in Sooke's waters. A boat full of fishers right now can mean a boat full of pinks in a few hours.